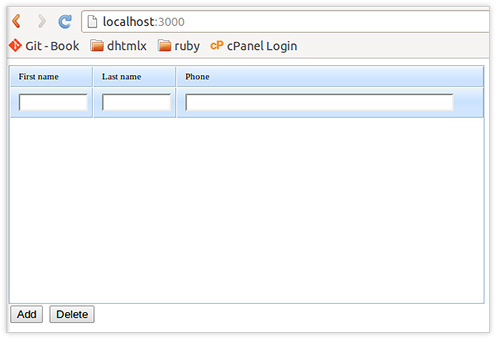 This is the update for the previous tutorial that explains how to use dhtmlxGrid with Ruby on Rails backend. We have rewritten this tutorial to be up to date with the latest RoR version. By following this step-by-step instructions, you will get an editable grid that loads its data from Ruby on Rails and saves back changes made by end users online. Download and check out the final demo to see how it is done or follow the instructions below. 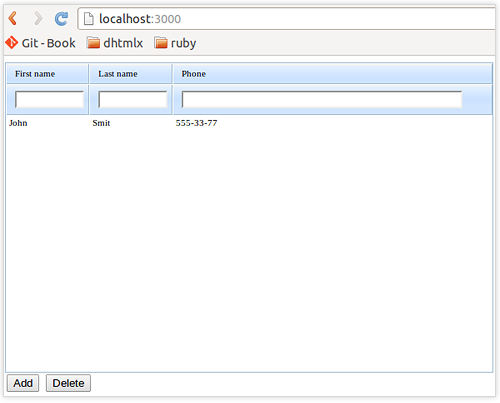 To get started, create a new Ruby application that will include dhtmlxGrid. If you are using Linux, be sure to install Node.js, it is the mandatory dependency for Rails 4.x. After running this command, Rails generates a set of files required for our application. Thus, we make the page “index” the main page of the app. Let’s check if the page “index” is rendered. Before starting the server, delete the file public/index.html. It is necessary for displaying the needed page and not the home page that was automatically generated while creating the app. This is the result of rendering the file app/views/admin/index.html.erb. In the directory “public”, create a directory with the name “assets” and copy the folder “imgs” from dhtmlxGrid/codebase/ into it. This file is a template for all the pages of our app where common elements are placed. So, we’ve got a working app: on clicking the “Add” button, a new row will be added, and on selecting a row and clicking the “Delete” button, the row will be deleted. However, our app works only on the client side at the moment and all the changes will not be saved after the page reload. That’s why our next steps will be creating a database and synchronizing dhtmlxGrid with it. This command will generate a new migration file db/migrate/[…]_create_users.rb and a model file app/models/user.rb. The names of the database table fields and their types are specified in this command after the model’s name – “User”. Thus, the table will have three text fields: first_name, last_name, phone. > User.create :first_name => "John", :last_name => "Smit", :phone => "555-33-77"
match "admin/data", :to => "admin#data", :as => "data", :via => "get"
This line tells dhtmlxGrid the address to send the data to and informs that the data will be received in JSON format. Instead of “” the necessary url will be inserted. The action “data” will read the list of records and return it to the client in JSON format. While loading the page, dhtmlxGrid renders the line “John, Smit, 555-33-77”. Now the app can only read data from DB. As for adding, deleting and editing the records in DB, these functions aren’t realized yet. Let’s add this functionality. 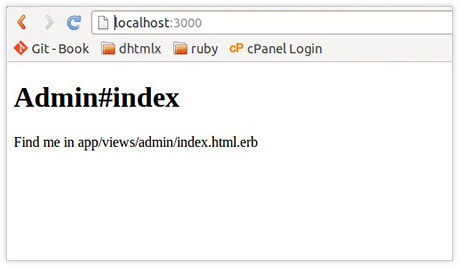 First, we define the URL where dhtmlxGrid will send queries to make changes in DB. match "admin/db_action", :to => "admin#db_action", :as => "db_action", :via => "get"
match "admin/data", :to => "admin#data", :as => "data"
The first line creates the object “dataProcessor” and assigns to the variable “dp” the link to this object. In place of “” there will be the URL through which dataProcessor will communicate with the server. In our case, it will be “admin/db_action”. The second line attaches dataProcessor to dxtmlxGrid. This action receives data from dataProcessor, processes them and returns the result of view processing “db_action”. This view doesn’t exist yet, you should create it now. All the variables in action, starting from “@”, are available during view processing. Then start the server and go to the page http://localhost:3000/. You can now edit, add, and delete records in the grid. All the changes should automatically synchronize with DB. Now we have finished our app. We have an editable Ruby on Rails grid that loads its data from the DB and saves all the changes while the end users edit, add, or delete records in the browser. You can download the final grid demo and see how it works. Hi, this looks like an awesome tool to do what I’m trying to do. Unfortunately I have an existing rails project and can’t just override all the existing layout features. I’ve tried doing it myself but the text boxes appear as labels. Is the “dhtmlxgrid_skins.css” supposed to be empty? I suspect this is what the problem is. Yep, this files is not used and can be empty. The page must include dhtmlxgrid.css and skins/dhtmlxgrid_dhx_skyblue.css to provide correct styling for the grid. Hi, (Remark : I use Ruby on Rails 4) I would know if is it possible to make the standard CRUD operations not inline over the grid but in separate pages or even better in modal forms ?. I’m newbie in Rails and if this componet seems awesome for my targests. If answer is yes I’ll will take in mind. Yes, you can use other dhtmlx components in combination with grid. For example you can init dhtmlxForm in the dhtmlxWindow and bind it to the grid – so it will allow to edit data of selected row in modal popup form. Including each dhtmlx component js/css asset individually looks silly. All the dhtmlx assets should be integrated into rails assets pipeline. Unfortunatelly I am having problems doing so with dhtml.css file. sprockets treat them as invalid due to some non standard features used in the file. Artem, you may try to update dhtmlx to v.4.0. It has more clear CSS so it might solve this issue. This is limitation of dhtmlxGrid – the same cell can’t be included in a rowspan and in a colspan in the same time. I’ve downloaded the final demo and have it up and running. However, if I try to add a footer, using the code: grid.attachFooter(“First name, Last name, Phone”);, I get a completely blank grid and no error is output to the rails server console. Any idea what I’m doing wrong here? Paul, unfortunately the attachFooter() method is available in PRO version only. I downloaded the demo and I noticed that the CRUD operations (create in particular) are done via HTTP GET requests and not over HTTP POST requests which should be the correct way to be executed. After this is done, of course, Rails complains about the “ActionController::InvalidAuthenticityToken”. How can this be overcome with the DHTMLX controls? Note: I am actually using the Scheduler component, but the same issue applies. Also, to bypass the CSRF check by excluding the controller action form CSRF is not an acceptable solution. Any guideline is highly appreciated! The dhtmlxGrid is indefferent to your sever-side for the server-side sorting implementation. 3. Set the position and direction of the marker in the grid header that shows sorting direction.